When iN Spain, try this sweet treat! Did you know that Spain is the second largest producer of rice iN Europe? As one of the world’s most widely consumed foods, rice is awaiting you in a myriad of Spanish dishes, from savory to sweet, at breakfast, lunch and dinner, plus a popular street food inbetween meals. Spanish cuisine is one of our favorites at iNSIDE EUROPE and just like there are multitudes of recipes for German Chocolate Cake, even classics like the iconic dessert, Arroz con Leche (Spanish rice pudding), vary greatly not just from chef to chef, but also from region to region. 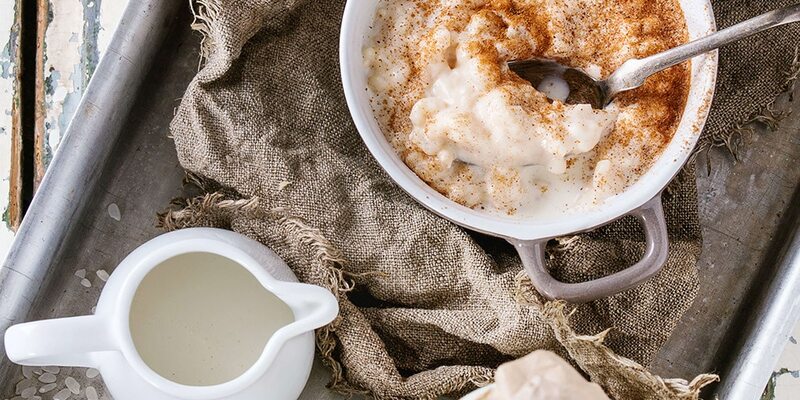 Spanish rice pudding is said to have been around for over 1,000 years and to have originated in Asturias. Check Spain’s official website for a great read on ‘A Thousand Flavors of Rice’. For the home chefs among our travelers, we share a simple yet delicious recipe from one of our favorite Spanish food blogs, Spain on a Fork. Grab a large frying pan, heat it with medium heat and add 4 cups of milk, 1 vanilla bean, 1 cinnamon stick, and 4 lemon peels. Mix everything together. Once your milk begins to lightly boil, add 1/2 cup of rice to the pan and mix everything together. Continue to mix so the milk doesn’t froth and create a film 10 minutes after adding the rice to the pan, lower the heat to a LOW heat, add 1/2 cup of sugar to the pan, and mix everything together. Continue to mix so the milk doesn’t froth and create a film. About 15 minutes after you added the sugar to the pan, your rice pudding should be done, you can always tell by running your spatula through the pan, and if you can see the bottom of the pan, you have a perfect rice pudding. Turn your burner off and let the rice pudding rest for about 5 minutes. Spoon the rice pudding into small bowls. Sprinkle with some cinnamon powder and garnish with a mint leaf. Enjoy! iNSIDE EUROPE Tip: As Cinnamon lovers, we like to add an extra cinnamon stick to each serving which can be used to stir the dessert, and makes your food photos look even prettier (Instagram! ).